Jack Curtis earned his second straight TOSA Decathlon Championship on September 6th, and came very close to earning a record number of points in the process. John Wood finished second and 3-time champion Gary Bernklow came in third. 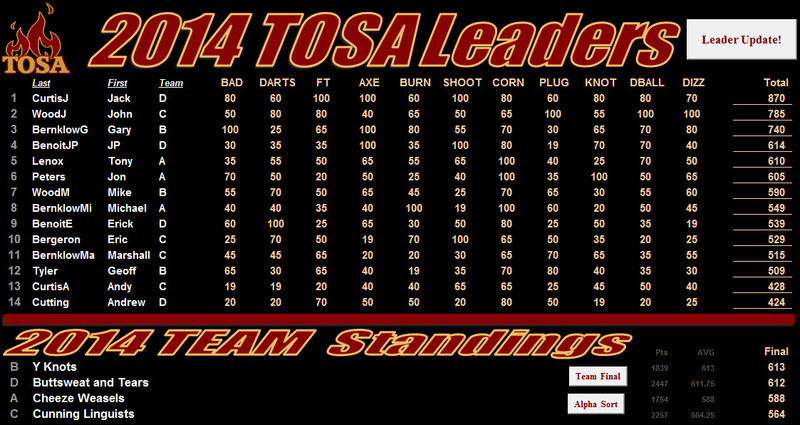 Finals standings are shown below. In the team standings, the Y-Knots edged out Buttsweat and Tears by only 1 point to take home the team trophies. Congratulations, Jack. If you would like to participate in the 2015 TOSA Decathlon, please contact the CEO.